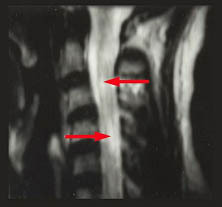 MRI is the most sensitive imaging technique for the evaluation of Multiple Sclerosis. T2 and FLAIR sequences are particularly useful. T1 is the most useful sequence especially if periphery of the lesion shows T1 hyper intensity. Multiple Sclerosis plaques are often ovoid in appearance and point towards the ventricle reflecting peri-ventricular inflammation. 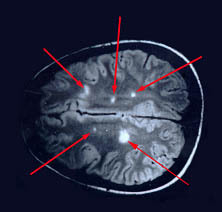 MRI with contrast is useful for demonstrating disease activity in Multiple Sclerosis. CT brain is not as sensitive as MRI and is not being done.